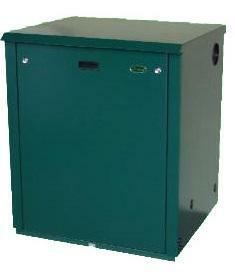 The Outdoor Combi COD4 Plus is a floor-standing, condensing, Combi oil boiler, designed and manufactured by Mistral. A high efficiency rating of 92% will help lower your energy bills and an output rating of 35-41 kW makes this perfect for homes with a high demand for heating and hot water. This highly reliable unit provides instant domestic hot water, has a fully-insulated weather resistant, zinc phosphated casing to protect the boiler from corrosion as well as a polyester coating that has a green finish helping to blend in with the surroundings. It’s said to produce twice as much hot water as any other Combi boiler, making the unit perfect for home with high demands. The entire range come fitted with a frost stat helping to protect your boiler from the cold wintry days when you need the boiler most, a multi-directional flue, a pre-punched pipe and entry points on the back and both sides for a quick and easy installation, no internal oil line and it can be used in tandem operation. With this boiler being available as a condensing boiler or non condensing boiler, you can be sure there is a boiler to suit you. Featuring a 2 year warranty on parts and 5 year warranty on the heat exchanger, the Plus CODC4 will give you peace of mind that you’ve installed a reliable boiler.